D/deaf and disabled artists in the UK are currently preparing for the Unlimited Festival disability arts extravaganza, or about to call the numbers in a wonderful new take on bingo for the Liberty Festival – Bingo Lingo – starring Daryl Beeton and Nickie Wildin, the latter in a role very different from her Miranda at the London 2012 Paralympic Opening Ceremony. Today (Fri 2 Sept) my partner in crime Bradley Hemmings (who co-directed the Opening Ceremony with me) and Laura Jones from Stopgap Dance present the Heritage Flame Ceremony at Stoke Mandeville and on September 7th, the torch will arrive in Rio, where I am currently, working with Circo Sem Limites at Crescer e Viver. This project was born out of the London 2012 Paralympic Ceremony training we did with The National Centre for Circus Arts which led to a joint venture called Belonging, which we premiered at The Roundhouse in 2014. People’s Palace Projects then did a million and one funding applications and Circo Sem Limites was born. We had hoped that the Paralympic Opening Ceremony here in Rio would use the newly trained artists but this has not happened so we are creating a show for the Cultural Olympiad, which is a circus take on scenes from some of Shakespeare’s works. It is brilliant seeing how the tutors have really built on their inclusive teaching practice and have explored new ways of accessing back flips and somersaults for blind artists. The care, detail and learning will be captured in a film that will be shared with Japanese artists as they begin to prepare for their ceremonies in 2020. 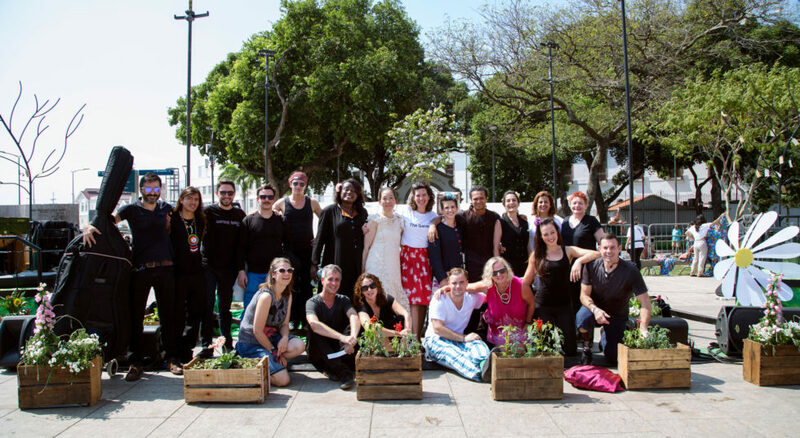 Graeae and Strange Fruit’s production of The Garden by Alex Bulmer is also part of the Rio Cultural Olympiad, now with a mixed cast of UK and Brazilian artists and being performed in English, BSL, Portuguese and Libras (Brazilian sign language). I am rather terrified as we have so little rehearsal time but also hugely excited, as the cast and creative team are so up for embracing this challenge. All this work being led by D/deaf and disabled artists in Rio and the UK, and all the Paralympians training as we speak is a testimony to the fact that we lead in great art and great sport, as well as on many other areas of life. Collectively we have fought – and are still fighting – for equality so what breaks my heart is that both UK and Brazilian governments are scrapping the Human Rights Act. But this will not stop us – on the contrary – our voices will get louder and we, with our allies across the industry like Rufus Norris at the National Theatre and the Ramps on the Moon consortium, will fight to ensure that this time around, the Paralympics DO have a legacy for the lives of D/deaf and disabled people across the world. The games and Unlimited Festival next week are a huge opportunity, and I hope our governments sit up and see how much D/deaf and disabled people can offer.